Wilfrid Laurier University student Lauren MacBean is responsible for creating the Special Olympics Unified Partner Program here at Laurier. This program is a partnership between the university and Special Olympics Ontario. It brings Special Olympics athletes together and it gives them an opportunity to play basketball every week. The inception of the program happened during this past summer when Lauren MacBean reached out to Laurier recreation for this great cause. “The partnership was brought up to us by Lauren [MacBean]. She reached out to us and her initial idea was to host a one-day tournament, which is something that we are hoping to do in March by co-hosting it with the University of Waterloo,” Stefanie Kubacki, Laurier Intramurals and Instructional Programs coordinator, said. “We have all the Unified Athletes for next semester. It is something we want to continue on in the winter semester. As long as we have the interest from the Special Olympics athletes and the Unified Program athletes, we would like to continue this in the years to come as well,” Kubacki said. “That was Lauren’s initial ask but unfortunately with our constraints on our facilities, we decided to co-host with Waterloo — and that’s something we are still planning. So instead, with the program that we already run with intramurals, we decided why not just let a team play regularly,” she added. 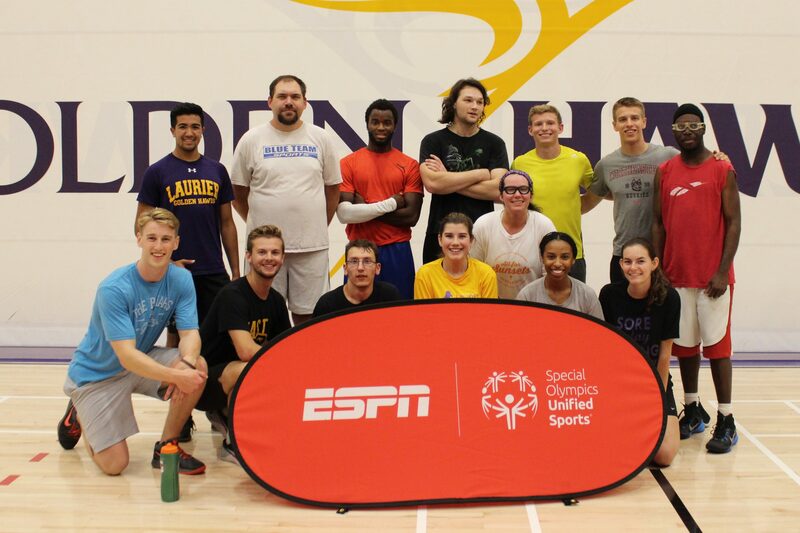 The Unified Partner Program has now become a regular part of the Intramurals program at Laurier. On Mondays, the Special Olympics athletes get together with their Unified Program teammates (usually students at Laurier). “The Unified Program works as a one-to-one relationship. For each Special Olympics athlete, there is also a Unified Program athlete playing. They just play intermingled during the games. Usually it’s three Special Olympics athletes and two Unified athletes. They show up every Monday and play basketball,” Kubacki said. Although this partnership has only recently gotten off the ground, it is something that Laurier Recreation hopes to continue in the future. The one-day tournament co-hosted by Laurier and the University of Waterloo is planned for March and it looks to be a fantastic opportunity for Special Olympics athletes, thanks to a great idea from a Laurier student.